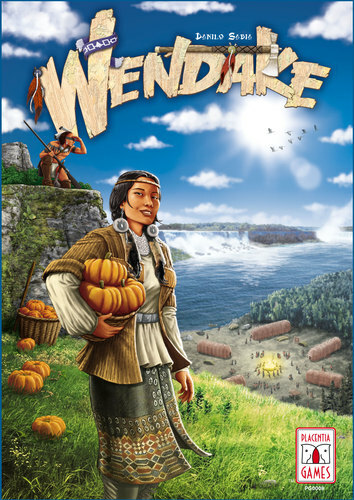 In Wendake, players act as a chief of the Wyandot Native American tribe – over the geographical area of what is now the Great Lakes region in the US and Ontario in Canada. Each player starts with an Action board with 9 starting tiles, but throughout the game, you will be trying to improve your action choice in order to advance the furthest on the two pairs of scoring tracks in the game. You have to excel in all things because you will only score the lower point value for each pair of tracks. There are four track markers, and they are randomized to the four tracks at the start of each game. 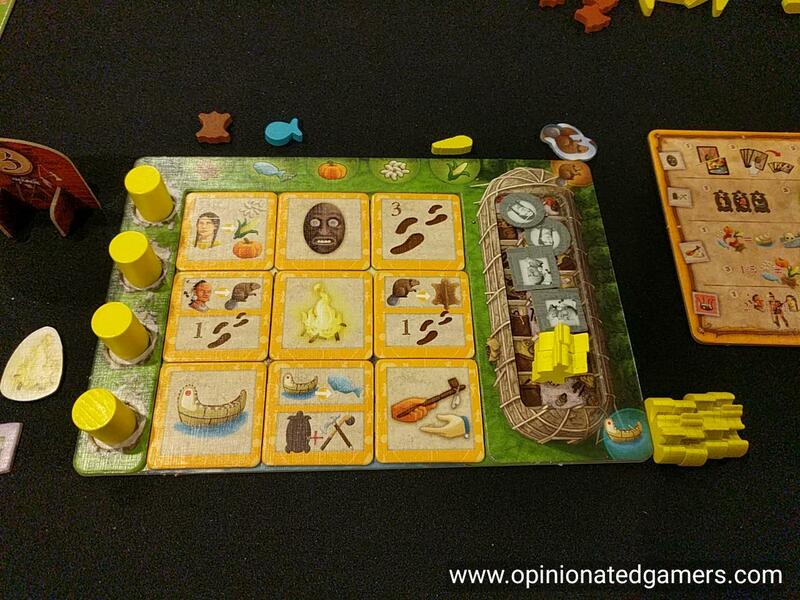 Each player starts the game with 21 Natives (7 Warriors, 7 Women, 7 Hunters), 5 canoes, and some starting resources which are found on their Tribe card. You can choose to use a generic tribe where all players start with the same stuff, or you can each choose an individual tribe that has differing starting positions as well as a unique special ability. Some of the Natives start on the game board and some start in the Long House area on your personal Action board. The Sacred Fire action tile is placed in the center of the 3×3 array on your action board and the other tiles are placed randomly on the remaining 8 spots. The Turtle tiles and the Level 1 action tiles are set up near the board. Move – move your Warriors equal to the number found next to the feet icon. Note that you only ever move Warriors. Women and Hunters are put on the board by replacing the Warriors that move into areas. Warriors can be laid down in a special productive area in a region to become an Outpost tile. Only one Native can occupy a Productive area. These Outpost tiles can later be converted into Women or Hunters (as depicted on that particular area). Warriors can also stand in a territory to act as a Guard. Otherwise, they can move into adjacent areas on the board. If you move into an area with an opponent’s pieces on it, you can choose to fight. In a fight, Warriors cancel each other out. Warriors always win against Women and Hunters. All injured Natives go to their owner’s Long House area. Military – count up your productive areas with women and those with hunters. Count up your canoes in play. Then take up to one turtle tile of each type (women, hunters, canoes) that matches or is less than the number of each you have in play. There are 9 total types of tiles, and you may only ever have one of each of the 9 types. Then score 1 VP on the military track for each territory where you have the most Guards. Mask – Draw a Mask card from either the top of the deck or the top of the discard pile. Then play any combination of cards from your hand that matches an unclaimed combo on the ceremonial mask area on the board. If your mask marker is already on the board, simply move it to the new space (thus opening up the space you used to be on). Score however many points the board tells you to score on the Mask track. Trade – First, you can trade resources with the supply – one for each Canoe that you have in play. 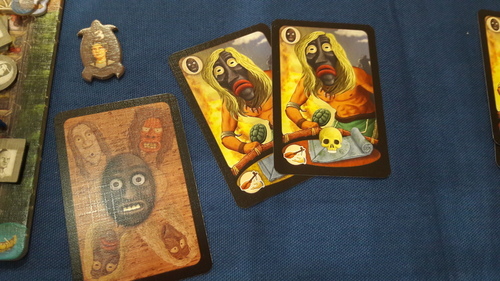 However, if you trade, you must then flip over the top Mask card to see if you contract Smallpox (which forces you to remove 1 Native from the board). Then you can buy a Progress tile – the cost seen on the price tile near the row. When you take a tile, you score 1/2/3 VPs on the Economic track as well as 1/2/3 points on the track indicated on the tile itself. Finally, you can spend up to 5 different resources of your choice to score an equal number of points on the Economic track. Sacred Fire – place your Sacred Fire marker on any available action tile that is not in the row that you intend to use this year (because you cannot activate a tile more than once a year). You do not move your action marker from the Sacred Fire tile. Ritual – this is the icon found on the back of each Action tile – when you take this action, you take 2 natives of your choice from your Long House (on your personal Action board) and move them to your Home territory on the game board. Then, score points on the Ritual track equal to the number of Native type that you have the LEAST of in your Home territory. Swap token – this is not found on an Action tile, but each player gets one Swap token at the start of the game. You can choose to spend this at any time to swap any 2 free Action tiles on your 3×3 grid. Discare the Swap token after you do this. To prepare for final scoring, first you apply your Turtle tokens. Reveal all the tokens and apply the points shown on them to the tracks shown on the tiles. Then, for each pair of scoring tracks, score points for the lower value. Then, add one point to your total if you did not use your Swap token during the game. The player with the most points wins. Ties go to the player closest to the start of turn order on the track at the end of round 7. 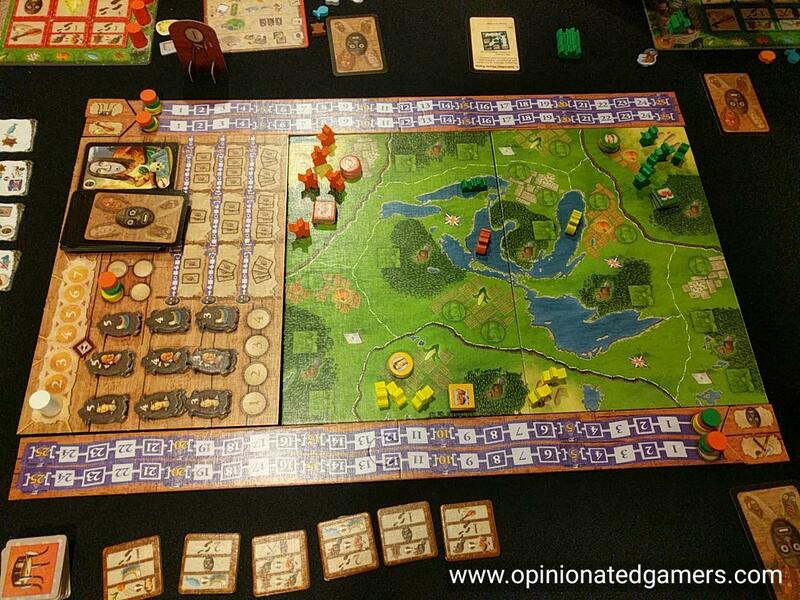 Wendake was one of those games which I couldn’t figure out how it was going to work from reading the rules – mostly because, on paper, it seems like a total mish-mash of things. The play on the board is a mild sort of area majority – which helps you score on the Military track – and those Natives will also end up gaining you resources. There is a fair amount of resource management that you need for the Trade tiles – both to acquire them and then to use some of the special effects on them. Your own personal board is a little action selection area, and then there is a bit of deckbuilding action thrown in as you change your pool of possible actions each round – as well as adding supplemental actions through the Trade tiles. The Mask part of the game is set collection. Sound confusing? Well, as I read the rules on the plane ride over to Europe, I was befuddled. However, after getting a short demo from the Placentia stand on Wednesday, it was pretty cool how all those different ideas blended together into a coherent game. In some ways, it was like each different part of the game felt familiar, which made it easier to grok them together as a whole. For me, the stand out mechanic is the action selection bit on your ever evolving personal board. There are an abundance of interesting choices to be made here. Trying to figure out which actions to take, and when to take them is not as simple as it seems. Knowing that you’ll have to flip over all the tiles that you use makes the selection a doubly difficult choice. Early in the game, you probably want to take as many face up actions as possible – as you are trying to set up your engine here. 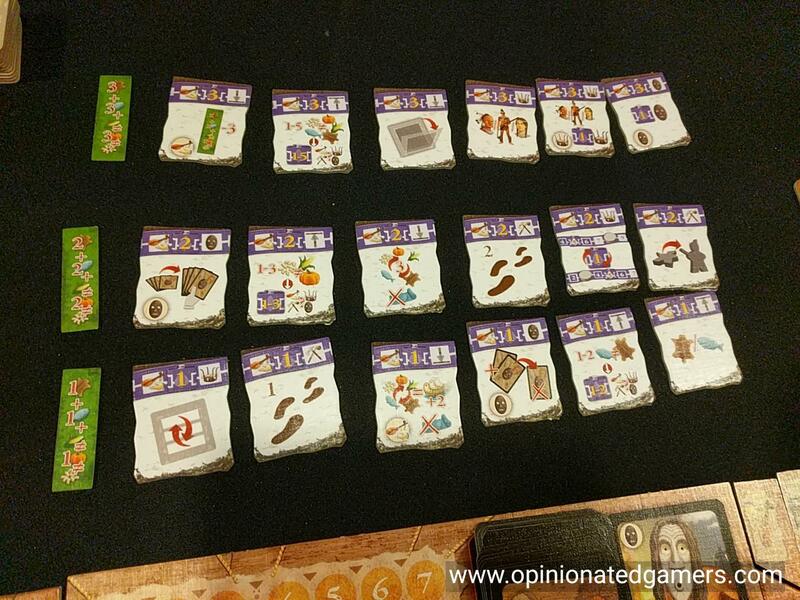 However, later in the game, the Ritual actions which are found on the back side of every tile come in handy as they are the only way that you can score points on the Ritual track. The Mask and Trade tracks seem to snowball a bit. Since you never get rid of your Mask cards, if you start going down this road, it should become easier and easier to score higher point combinations each succeeding round as you have more cards to choose from. Likewise, as many of the Trade tiles give you bonuses towards other Trade tiles (or allow you to exchange resources, etc. ), getting a few useful Trade tiles often makes it that much easier to get more in the later stages of the game. Of course, if you devote a lot of actions to these tracks, it’s hard to get enough done in the others… And the key in this game is figuring out how you want to balance your actions towards all four of the tracks. There is a bit of time pressure to get things done as some of the components (Trade tiles) are in a limited selection while other actions (such as Military scoring or resource production) need to happen when the board setup is favorable for you. Further compounding the pressure is the knowledge that you have a fixed and limited number of tile actions. Over the whole game, you only get to use 21 tiles, so you need to make the most of them. Careful planning is important to make sure that you get meaningful actions as much as possible. There isn’t a lot of room, for instance, to “waste” an action on a Ritual when you didn’t need to do so OR to choose a line on your board which causes you to take a very inefficient action. 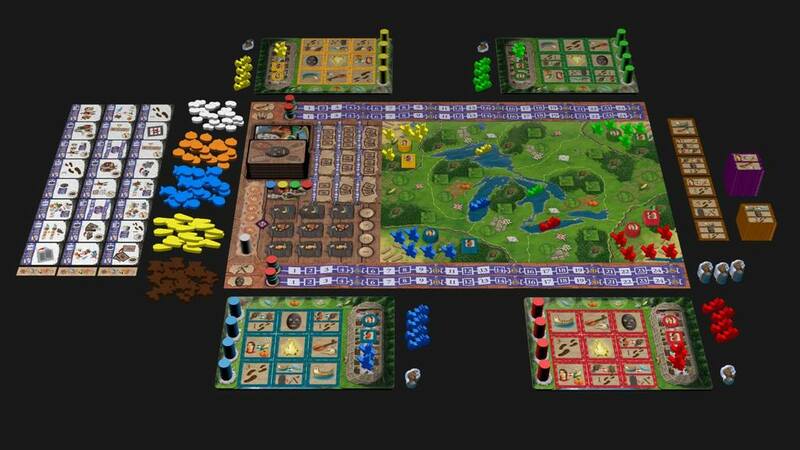 The board is quite tight – in the three player board, there are only 5 non-Home regions on the board. This means that you are always right next to someone else, and there is constant battling for position – whether it be for Production areas or for placing guards. The streamlined combat rules makes this simple (wood cancels out other wood; wood always beats cardboard) and intuitive. You need to try to set yourself up to be in the right position and then quickly take the action that uses the board position to your advantage. I have found that I often try to set this up over two rounds – if I know the turn order for the next turn… so that I might use the final action of a round to move pieces on the board knowing that I have first move in the next round where I can then make a huge Harvest with all my newly placed pieces. In my first few plays, I have found that I always have plenty of choices on a given turn, but never so many that it has caused me to freeze up from the choice. Sometimes, when in doubt, I look at the scoring tracks and I make a move to improve the one I’m the further behind the mate of. I have been competitive working on a fully balanced strategy, and I have also done well working on a single pair (scoring 23 for that side once!) – so I don’t think that either strategy is stronger than the other. The games seem to be coming in right around 25-30 minutes per player, and that’s feels just right for this game. Though there is some direct interaction on the board as well as some indirect interaction in the competition for Trade tiles, I usually can spend most of the downtime between my turns trying to figure out what I’m doing next. I will also take a glance at my opponents boards to try to figure out what they’re going to do based on their moves so far this round to see if I have to rush to get something done before they beat me to that opportunity. I have enjoyed my first few plays a great deal, and I am definitely looking forward to playing again soon. This one ia defintiely a keeper from Spiel 2017. Alan H: I agree with Dale’s analysis about the game and especially the changing action system. The game is enjoyable as there is significant planning involved but enough variation that games produce different routes to score points. Interaction on the board is interesting but not brutal; there will be times when you need to grab a resource or area so need to work out how to do so. Turn order can be important and I like how you can use this to mark time or use it to ensure you get an upgrade tile that you think you need. I really appreciate the variety of choices in this game and this is helped in this game by the range of Progress tiles. You only use a fraction of them in each game and they can significantly affect your victory points. So far, this is one of my top 5 from Essen 2017 and my second surprise from the show. James Nathan: I was a tentative “I like it” after one 2-player game. This executes the cute action rotation in a way that feels exactly what I would want in that gimmi-chanic. I enjoy that the “Knizia scoring” is broken into the two halves allowing that balance vs specialization at the same time. My tentativeness was based upon the board combat – I don’t mind such confrontation in a 2-player game because well, what are you to do. However, in a multi-player game, why me – attack that other player!? #Snowflake. After a 4-player game, I’m a tentative “I love it!” I finished a distant second, but I’m comfortable that minor military incursions aren’t “See you later, thanks for playing” moments. Meanwhile, having more knowledge of the games’ systems, being able to have an overarching strategy (in theory), and attempting to execute it (Spoiler alert: I did so poorly) – all leaves me wanting to play it again. This thing is great.